Teachers biographies and class descriptions of the contactfestival 2014! The classes are not divided into levels. The classes are open to any experience in dance and movement. Please read the descriptions and respect your own limits. In the registration process you will choose your intensive. Just make your decision depending on the themes of the intensives. The classes you can choose spontaniously at the Festival. On the first day we will focus on Contact Improvisation principles. Adrian is travelling all over Europe and sometimes intercontinentally to teach and perform Contact and Free Improvisation. He is deeply involved in CI since 1992 and in the meantime he is dedicating the biggest part of his life to this wonderful dance form. After his studies of New Dance at “bewegungs-art” in Freiburg/Germany he continued his further education with many different teachers, among them Steve Paxton, Nancy Stark Smith and Nita Little. Besides this his teaching is influenced by his own research work and by studies of different kinds of martial arts and of Craniosacral Bodywork. In his teaching he focuses on the technical aspects of CI as well as on matters of perception and on a creativity coming from a distinct body-awareness. For him the pleasure to play, deep engagement in the dance, total presence and respect for others are the basis for gaining the most possible in dancing CI. As a performer he works with many different international artists and his performances are primarily based on Free Improvisation incorporating Contact Improvisation, dance, dance-theatre, voice and live music. Where does my dance lead me to when I give full commitment to gravity and to the movement flow? How does a lift feel like that moves both of us through space and through different levels? How can I find trust to follow my partner unquestionably? Following through is one of the core principles of Contact Improvisation - this is what I found in the last years of dancing, exploring and teaching this form. Following through is at the edge between surrender and leading my movement actively, it is much more than just letting the dance happen. To follow my own movement impulses, gravity and my partners dance I have to be totally present and to develop the ability to change the direction of my movement at any split second. Moving in this way will bring me inevitably into the very here-and-now - and the dance evolving from there may be very wild and fast or almost not visible from the outside. In this intensive we will explore Contact Improvisation as well on the level of movement technique as from the improvisational point of view. This can be very demanding and liberating at the same time! You will need to find your trust, surrender and sometimes also your courage to follow the offered material, but over the time you will discover the big freedom, the excitement and the grace coming from the principle of following through. In 1981 Scott Wells discovered the pleasure of contact improvisation shortly after becoming obsessed with the struggles of modern dance. 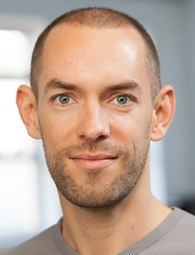 He stuck with both and currently directs a company in San Francisco and tours often to Europe. He is known for his flying workshops for contactors and his partnering syllabus for contemporary dancers. Scott’s workshops include Wrestling with Affection and jumping ≠ Flying. 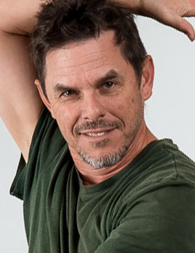 Scott has created works for skateboarders, for boxers and choreographed West Side Story for Sonoma State University. In 2010 and 2005 he received the Izzie (San Francisco’s most prestigious dance award) for Best Choreography and was selected by Dance Magazine as “one of the 25 To Watch”. X-Ray Touch refers to the way contactors sense into the partner’s body; do we sense where their elbows are when we’re not touching them? How far does this go? I would like to see how deep and rich we could enter the sense of touch to a place of certainty of individual desire. We go for losing/finding ourselves in curiosity, sensation and reflex. From the clarity and immediacy of sensation we will expand our focus for group work and intuitive ensemble. I will use favorite contact exercises created or learned over 30 years of investigation and indulgence. I will probably toss in some wild or precise flying maneuvers to undercut the preciousness of ideas and to bring us together in group effort and support. I’ll take time to vibe out the needs and interests of the group. Sara Shelton Mann: Alwin Nikolai and Murray Louis Companies, 1968-72, Halifax Dance Co-Op 74-79. 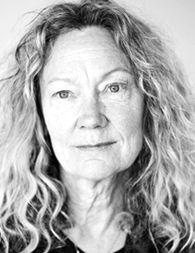 She moved to San Francisco in 1979 and developed the performance group “Contraband” (collaborating with Keith Hennessey, Jess Curtis, Jules Beckman, Kathleen Hermesdorf amoung others) touring from 1979-96. She collaborated with Guillermo Gomez-Pena 1996-2000. 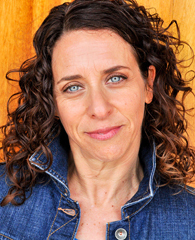 Since 2000 she has taught and created performance work internationally. Her awards include 6 Isadora Duncan Awards, a Guggenheim Fellowship, a Gerbode Choreographer in Collaboration Award with David Szlasa. 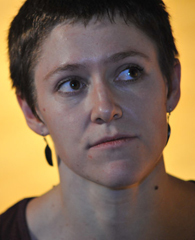 In 2012 through a Dancers Group Award she took a group to Moscow, Russia and the Archstoyanie Festival suported by Mutual Trust for Understanding and the U.S Embassy. She is a practionier of several healing modalities and integrates her research with her teaching. Engaging with information we receive through the visual, kinesthetic and auditory fields and how we relate – we will delve into the unknown together through contact – the bones, nervous system, belly and hips, solar plexus, heart, throat and head as transmitters of relationships that are clear, awake and available to everyone. Skills are important and how we use them is the ground of understanding. Points of contact are like satellites and the flow of energy we move with contact is the force of nature we choose. Specifically we begin with the feet, hands, eyes reaching out into the world to gather information. These are the gates into how we negotiate the terrain of our awareness. These are also the gates into perception and how we track our physical peripheral extension into the core. The bones define our stability and our traction into the core, our reaching outward and inward, our alignment and our ground, the spine our divine electrical nuance within and our extension from the bones into lightness and agility. The centers of influence and relationship – move through the hara, solar plexus and heart into the throat and head. We open and breath into these into an ease of relationship. Implied direction is a landscape I have developed through years of hands on healing work. It directs the tissue into a conversation through touch – specific, clear and trackable. You touch before you enter into physical contact and your intentions give immediate feedback both to you and your partner. We will explore this in several ways or applications: you receive what you give, you follow what you intend and you embrace what comes to you. Layers of texture and touch are readable and complex and deserve the time and the patience to explore thoroughly and in depth. There is a saying that you can only give what you have – one of my teachers taught me this. 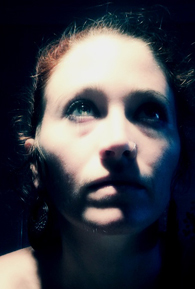 Christina is a movement/dance teacher, performer and choreographer based in Athens, Greece. 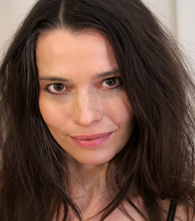 She is also a body psychotherapist and Shiatsu practitioner. Her work is a 25year-long exploration of movement study applying her experience from various modalities in Somatics into CI. During her studies in NYC (1986-90) as a contemporary dancer, she started her practice in CI in 1987 studying with the first generation of teachers. 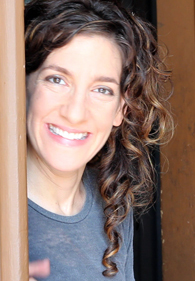 Since 1991 she teaches dance/CI regularly, organizes workshops and performs in Athens and other places in Greece. In 2009 she opens her own studio, Present Body, center of movement & performance research where she teaches daily classes/labs on awareness through movement and CI for all levels. Christina has been travelling in various cities of Europe, Asia and the U.S. teaching at numerous CI festivals, venues and ECITE events. Since 1993 she has been co-teaching and organizing 10day intensives with prominent CI teachers from other countries. The Indonesian master Suprapto Suryodarmo has profoundly influenced her work. Dance and particularly, CI as well as therapy support her to consistently study and share with others what means “being in contact with the essence”- to study our humanness through the language of physical and emotional intelligence. Presence through touch and spatial awareness is our platform. We explore CI skills using hands on work to bring mindfulness, embodiment and inspiration from our fascia systems. Exploring energy, tone and a wide range of pressure in our bodies, we experience soft and elastic movement, our 3 dimensionality, connectivity, unity and flow. The depth of pressure and shifts in tone as we release tension, determine the movement language of our dance in relation to our partner and space. Being in touch with the oscillations and the inner pulsations that become pathways of energy and deploy into movement, we experience fluidity, musicality, better connections that support integration. We discover the poetry in our dances. As we enhance awareness, we open ourselves to being creatively responsive, consequently, expressive. Unpredictable changes in dynamics, levels, touch, weight sharing and speed as perceived by our partner too, become the canvas of our mutual composition in the moment. We are interested in breaking habits safely. CI becomes a dance meditation, a play of qualities or “states of being” as we improvise. It is strongly recommended that participants have already been on a continuous working process of experiential practice on the principles of CI. It is very important that movers have already acquired some physical understanding of one's use of weight dancing together in flow. 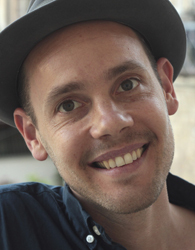 Shahar is a movement and performance artist and teacher; he is also the director of Shahar Dor Company and ARTNESS.ORG. His multi-layered work benefits from over 20 years of research of the moving body, performance and the art of image creating. 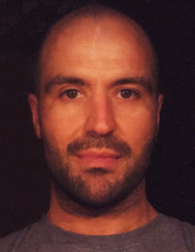 His work is inspired by B.M.C, Feldenkrais, CI, martial arts, contemporary dance, Butoh, visual and digital arts, by great teachers, brave travelers and aware experiencers and by living a life resonating from his body and visions. He is a visionary artist, his independent thinking, dedication and passion for practical and theatrical life art processes has been developed through the years to a core practice and stile, bridging times, cultures and people through a deep sense of human physical presence. Famous for his teaching of intuitive skills and instinctive art and for his passion, humor & vision, in the last 20 years Shahar teaches, perform, organize and facilitate numerous artists and creative projects all over the world. In this intensive we will touch the fusion of technique and presence in improvisational performance. We will practice the core elements of Shahars' SOLO work and his science of image creating; focusing on the juxtaposition of space, time and body we will practice and play with synchronicity, exposure, rhythm and more, informing and fertilizing our dances and presence. This practice involves specific physical practice, improvised solo and CI research, working in front of the group, exploring in small groups, and answering materials that rise from the work of the group. … Opens up possibilities, create specificity and empowers independent artistic vision. ... Stimulates our multi-layered poly-rhythmic bodies to open up, awakens our intuitive skills, and creative and communicative instincts. … Allows the subjective profoundness of presence fuses with the incredible complexity of the moving body and the music of our dance to be heard. … Awakens the instinctive artist, empower and inspire the moment of creation & performance. This work is fruitful for those who wish to empower their connection with their creative sources and forces, inspire and learn together and from others. This work involves curiosity, listening, awareness, passion, humor and vision. DOUBLE CLASSES - all co-teaching double classes from 14-16 Uhr + next day - same time!! is a dance artist and devoted collaborator who explores perception, memory, and the politics of transgression. Her research in CI concerns ways the form both resists and conforms codification. Her studies with Deborah Hay, Lisa Nelson, Eva Karczag, Nina Martin, Mary Reich, and Susan Leigh Foster significantly influence her approach to dancing. 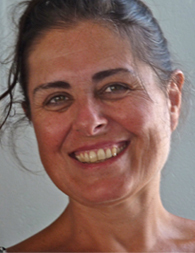 Currently, she is studying at The Feldenkrais™ Institute of San Diego, and with Eric Geiger, she co-directs PADL West, a non-profit organization. With Angela Guerreiro, she is co-curator of The Live Legacy Project, a Tanzfonds Erbe Project. Karen Schaffman & Anya Cloud are artistic collaborators living in San Diego, California. Anya began practicing CI at age 19 and will never stop. Karen was introduced to CI at age 23 and after fifteen years of CI practice completed her doctoral dissertation on the form. They both teach Dance Studies at California State University San Marcos, as well as within many other communities. Together and individually they practice, perform, teach and make work. This workshop is co-taught by two dance artists who are 2 decades and15 kilos apart. We invite all bodies to explore the often unspoken realities of who we are. In this workshop we propose an exploration of extreme scales through off-verticality, being under/over, soft collisions and intelligent recklessness. Often in contact fundamentals we are asked to find a partner of the same size. What if we don’t? What if we use the differences of our bodies to ignite high physicality and subtle responsiveness? What if size matters? What if we challenge dancing same-ness and discover possibilities for aliveness through our differences? 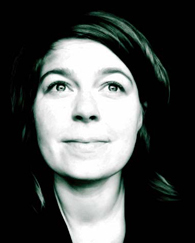 is a researcher, teacher, performer and writer of improvisation practices in various contexts including theatres, CI events and with living plants in outdoor locations. 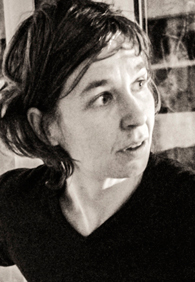 After training at PARTS in Brussels and completing her PhD thesis Twig Dances: Improvisation Performance as Ecological Practice at Dartington College of Arts, she became senior lecturer and Course Coordinator for BA Choreography at Falmouth University. She is currently co-editing an issue of the Journal of Dance and Somatic Practices ‘on Contact [and] Improvisation’, forthcoming 2014.
is an Aikido teacher/ practitioner and Kiatsu therapist, He has studied Japanese martial arts including Aiki-Jujitsu since 1989, and teaches Ki Principles through Ki Aikido, Kiatsu bodywork and contact improvisation. Together Richard and Malaika organize weekly contact jams/ CI classes in Falmouth and coordinate the annual Contact Festival Dartington and Conference in Penryn, Cornwall, UK. I start dancing at the age of 4. I studied ballet, flamenco and contemporary, graduating in the dance school of the Institut del Teatre de Barcelona in 2003, specializing in contemporary. I studied different escenic techniques as aerial dance, juggling, músic and different techniques in contemporary dance: release, lemon, graham and flying low. After various experiences of dancing in companies, I had a moment of confusion in which I was no longer motivated to continue repeating the movements that others proposed me. For a while I left dance and I got into the practice of yoga and meditation. Nearly a year later after leaving a Vipassana retreat I came across the Contact Improvisation in Barcelona in 2007. Since then I have not stopped dancing, studying, sharing and organizing CI events, traveling to Argentina, Germany, USA, Finland, France and Israel to expand my knowledge. I studied with many different teachers during this time and at the same time I have been sharing the knowledge of CI since I start it with people in my community in Ibiza and around the world. Since 2008 I have formed a part of the organization and creation of Ibiza Contact Festival. As a dancer I'm still interested in dance and improvisation techniques as well to share information and explore curiosity with others. Release and flying low has been a great help to my movement in Contact Improvisation and has helped me to easily learn the principles of CI. is a Finnish dancer, teacher and dance maker, who currently works and lives in Frankfurt, Germany. She graduated from the Vocational Dance School in Outukumpu, Finland 2004 as dancer, and holds a MA degree in "Contemporary Dance Pedagogy" from the Hochschule für Musik und Darstellende Kunst in Frankfurt, Germany. Since 2008, she’s been teaching Contemporary Dance Technique, Improvisation and Contact Improvisation both in Frankfurt and abroad. She is curious about the unknown as a source for creativity, and considers it to be the best teacher for change and growth. States of presence and the body’s ability to transform, embody, and transmit images, knowledge, emotions and ideas continue to fascinate and inspire her movement practice, research and life. This workshop is based on movement ideas that grow from our shared explorations and dances during past years. These classes are combination of physical exercises that support and prepare the body. Themes such as momentum, backspace, reading & re-directing the body in space, as some of our focuses, will tune the body. After, we’ll play with restrictions that manipulate the frame of choice, open different movement pathways and alter our physical vocabulary. We’d like to evoke movers’ readiness to become available with what is by merging other improvisational tools, such as, awareness of space & time, and by emphasising performativity to spice up our dancing. started dancing CI in 2001 when studied acting at the University of Performing Arts in Frankfurt. In these twelve years this weird and amazing Dance has increasingly taken space in his life and gave him many chances to travel, change and grow. Mainly influenced by the work with Dieter Heitkamp, Ray Chung, Keith Hennessy, Angela Dony and Nancy Stark-Smith. He cannot separate his learning process in CI, Acting and life. After six years of performing in the classic German theatre system he decided to dive into the ocean of freelance artists and now face the challenge of finding a balance in the mix of performing, travelling and sharing his ideas and experience in acting, contact and communication in Munich and abroad. To him it seems that life gives us the chance to grow and learn in every moment. We will work and play with some basic techniques, which enable us to feel safe in our dance dialogues and to have fun dancing in Jams. Our journey will bring us step by step from our own body on the floor up to higher levels with a partner. Giving and receiving weight, offering and recognizing invitations, centre-to-centre connection and simple lifts will be contents of this class. Furthermore I'd like to share some of my favourite ideas about "How to have joyful Jams" by spicing them up with some non-technical aspects such as surprises and playfulness... Let’s work! Let’s dance! Let’s play! Not only for beginners! is a dancer, dance maker and graphic designer. He graduated at SEAD, Salzburg. His approach to movement is based on the study of the body's intuition. The study of intuition enables to navigate through instability and develops trust in the body's capacities. His choreographic works explore narratives of body/relations. His main interest lays in utilizing coincidence into stable, communicative scenarios. 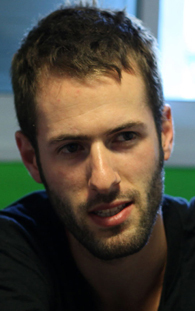 As a teacher, Matan's focus lays in CI and contemporary dance. He started to give regular classes in Israel in 2008, gave workshops in the Vertigo Dance School and the Israeli summer contact festival. Currently he lives in Vienna and teaches in Austria and Germany. In this class I would like to focus on how do we treat our own body before we get into physical contact with another person. Under this huge topic, I will focus on the potential of the “fall”. What can we drop in our own body in order to initiate movement and express kinetic energy? How do we free our body from unnecessary tensions? In the context of C.I, we will find these constant falls in order to get in touch. How can we maintain clear relation with our own body in the duet while reduce unnecessary tensions in it and find these magical moments when an inner fall in my body becomes a mutual fall in the duet and vice versa? has trained with several independent teachers as well as full time at Unicamp-Campinas (BR) and EDDC-Arnhem (NL). He also holds a Postgraduate Diploma in Contemporary Dance certified by the University of Kent, England. Jovair has worked extensively as a dance performer around Europe and Brazil. 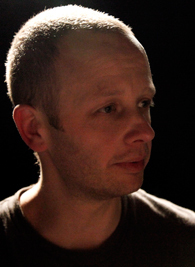 His teaching work is somatic based and explores both the technical and the performative aspects of movement. 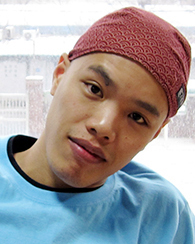 He has taught at different festivals and dance companies. He is currently a Dance Lecturer at London Contemporary Dance School (UK). His latest performance work involved both live and pre-recorded video projection in relation to live performance and music. We are going to work with enhancing our awareness of the center of the body and its connection with the breath, the pull of gravity and the rest of the body. We will expand this awareness into noticing our partner’s center when in contact. Through “slow contact” we will focus on “doing less” in order to notice subtleties of movement. We will look into the gravitation between centers when in contact and the interplay between supporting and giving weight through the center. We will then apply this to set tumbling movements with a partner, which will rely on the center-to-center awareness to support both the flow of movement and the orientation in space. Creating Relational Dance as Deep Personal Metaphor What Am I Doing? Where Am I Going? What Is Happening Now? What Happens Next? Who Am I Really? 1) Guidance into where we source from. 2) How we influence our choices in the moment, what is our long-range focus? 3) How does viewing perspective of the moment inform outcome? 4) How do we choose this particular arrangement? What can we get rid of to stay completely real all the time? 5) How dance informs & defines our experience, our self-identity, and our self-empowerment. has been practicing and teaching CI since 2005. 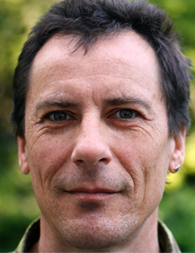 Having had participated in numerous workshops and festivals in countries such as the U.S., Germany, and Australia, his investigation into the form is influenced by the teachings of Nancy Stark Smith, Martin Keogh, Ray Chung, Tim O’Donnell, Joerg Hassman and Alejandro Rolandi, and also by movement approaches such as the Alexander Technique, Body-Mind Centering, and Ideokinesis. 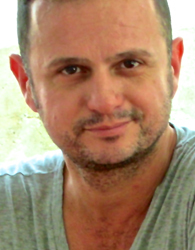 David was the festival organizer for Contact Festival Kuala Lumpur from 2011-2013 and has taught CI workshops in Malaysia, Singapore, Thailand, Cambodia, and South Korea. He loves to discover the ease and efficiency in moving, and to chance upon the pleasures of not knowing. I am fascinated by the differences between CI and other forms of partnering. In CI, there seems to be potential for the dance to delightfully surprise us if we choose to let go of the idea of a perfect position or a perfect state. One way to do this is to explore our relationship to the line of gravity. In this class, I propose we acquaint ourselves with states of off-balance. We will begin our exploration with stable structures, and from there, attempt to destabilize them into precarious states. These states will hopefully surprise us with unpredictable pathways and lead us into discovering the joys of not knowing. Skills such as rolling and falling will also be emphasized for safety. Open to all who want to have fun, take risks, and experiment. dancer and choreographer, has been practicing CI since 1992. Her main teachers are Frey Faust, Nita Little, Andrew Harwood, Kristie Simson, Daniel Lepkoff, Julyen Hamilton, Deborah Hay and Yoshito Ohno. She has danced for diverse co. In 2004 she founded her company Group B, and develops projects, which question norm and margin, and investigate the words we give and take. Her works integrate dance, words, drawing and photographs. After meeting Nita Little in 2002 she assisted her from 2005 to 2009. She has taught CI since 2003 internationally, and contributed to the development of weekly practices in her long time base of Paris. Since 1995 she has organized workshops, labs, meetings, exchanges and jams around CI and other movement-based investigations. Since 2012 she has been based in Brussels. Shall we break the rules? CI immerses the dancer within multiple physical forces: gravity, centrifugal, centripetal, and inertia. These forces can trigger a wide range of emotions from joy to euphoria of momentum to fear, frustration and more. It can also bring out social reflexes. All these forces unite into dance and communication with our partners. This class invites to receive and recognize these various invisible forces, these energies and emotions that run through us, the role we play while we dance. How can we use these forces in the shared dance? How can we support each other in physical and invisible communication? How can we bring CI to a personal and emotional level and anchor it in a shared instant? Buoyancy is related to lightness, and the action of bouncing back instead of sinking (for nonnative English speakers: a buoy is that object that bobs on the water’s surface). In dancing, buoyancy for me is deeply connected to the breath, and our constant calibration of the relationship between timing, momentum and weight. In this class we will build our intuitive reflexes and physical listening skills within the “Gravity Lab” of contact, while also finding room for buoyancy and play in our relationships. We’ll explore some useful material for integrating breath to achieve a “bounce-back” quality, fluidity, and confidence in our dance; we will work on getting into and out of the floor (and later, the air) with agility, safety and ease. is a dancer, performer, teacher and maker of dance and theater. 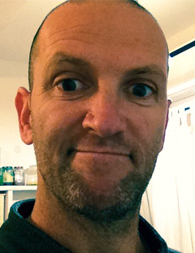 His work focuses on natural mobility, embodiment and presence. This is supported by an ongoing study of the movement of the body in different techniques, in the studio as a teacher or maker, on stage as a performer. 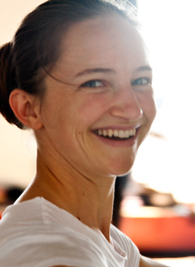 Robin is a teacher of contemporary dance at the Amsterdam School of the Arts and the Tilburg dance Academy. 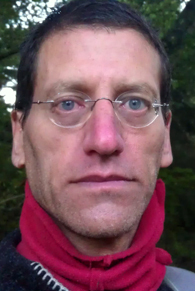 The main work he researches with the students is about experiential anatomy, release technique and contact improvisation. At Theater School De Trap in Amsterdam he teaches presence for performers, Chi Kung. He is also teacher of Tai Chi Chuan, Chi Kung, meditation and, recently, Thai Yoga massage. In this workshop I want to work with the presence and quality of body and mind from a tensegrity point of view. I will make use of my background in various somatic disciplines, Tai Chi Chuan and Chi Kung and my recent research in the myo-fascial meridians and tensegrity. When the state of mind changes and so becomes more refined, the state of body is invited to become more refined as well. Vice versa is also valid – when the body becomes more functionally integrated by working from a tensegrity understanding, the mind starts to integrate with the movement. By doing so, one develops a refined, embodied movement ability. You are able to expand into the space around you and become one with it because of imagination and reaching. You can fill the gap between you and the other with your imagination, with your reaching, with your aura, with the warmth of my body. So you experience touch before physical contact is happening. When does your body enter the space of the other? How do the spaces inside you change, when you start a CI dance? The ability of reaching, expanding, giving yourself to the space and the ability of listening to the other provide a base for CI as a form of communication, in which you constantly react to each other and are aware of the whole space around you.